Jaguar Land Rover India has announced the launch of its innovative new smartphone integration platform, InControl Apps, which has been developed in conjunction with Bosch. The InControl Apps platform transfers the interface from the phone to the in-car infotainment touch-screen, to allow users access to popular apps, thus significantly enhancing user experience. Jaguar Land Rover and Bosch have worked closely with leading third party app developers, specifically in India, to enable access to an initial suite of Android and iOS compatible applications. The India-customised platform will allow access to popular apps in India like NDTV, Hungama, MapmyIndia and Zomato. InControlTM Apps will enhance the overall luxury experience of our vehicles and provide technology savvy customers a more convenient option to access their favorite apps. This is an exciting new technology addition to Land Rover vehicles, which have already become popular for their design, performance, craftsmanship and luxury credentials. I am often asked whether phones will integrate with cars or perhaps phones will replace navigation systems. This smart phone integration solution is the best of both worlds. We ensure that ultimately technology serves the consumer in a convenient and safe way. For the tech savvy consumer, our products are built to delight. We are excited to be collaborating with Jaguar Land Rover India because both of us endorse quality craftsmanship to benefit the customer. We are really happy to get into this partnership with Bosch and Jaguar Land Rover India who have been great partners over the development of this first of a kind in-car news app in India. This truly is an exciting deal and extremely unique in the Indian digital media eco-system. This association further reinforces our leadership position in the digital space, something that has been built through credible content and great user experience. We are proud to announce Hungama Drive, the in-automobile version of the leading digital music app Hungama Music in association with Jaguar Land Rover India, the brand that is synonymous with best-in-class technology, style and luxury. As a company, Hungama has always been at the forefront of creating new music listening experiences and this has resulted in creation of Hungama Drive, an extension of Hungama Music for cars. Hungama’s wide content library and understanding of user-behaviour will create an unmatched entertainment experience for Jaguar Land Rover customers in India. Since 2007, in India, we have pioneered in-car navigation technology via our maps and navigation products. Our alliance with Bosch and Jaguar Land Rover India to build a mobile phone based car-synchronized navigation solution is another step to show that MapmyIndia is further building new technology for the Indian navigation market. The current Navi-sync product will ensure that end customers have the best in class navigation experience with 3D maps navigation, House numbers, smart single line search, rich point of interest information, live traffic, social media feeds and regional language support. 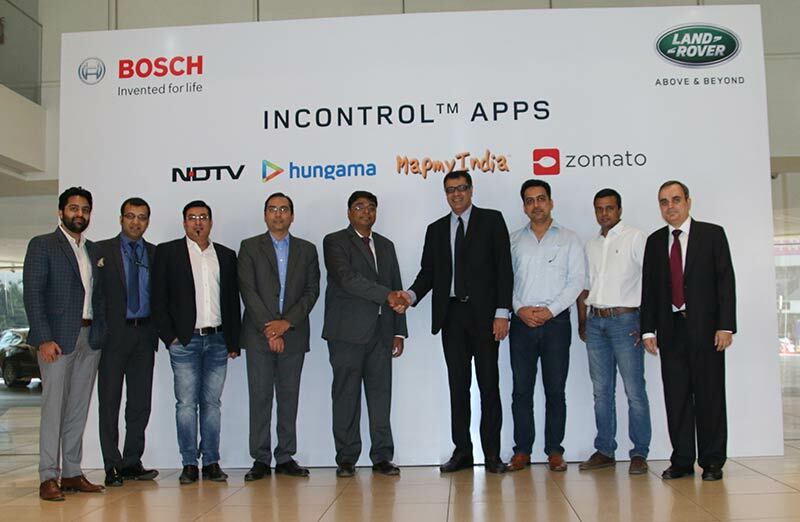 We are excited to partner with Jaguar Land Rover India and Bosch to enable their customers to access Zomato from their InControlTM Apps platform. Users will now be able to search restaurants, view nearby restaurants and curated collections from the vehicle infotainment system. We are certain that with this partnership we will continue to drive immense value for our customers across geographies. InControlTMApps platform is now available on 2016 Model Year Range Rover, Range Rover Sport, and Discovery Sport and will be rolled out on other Jaguar and Land Rover vehicles subsequently.